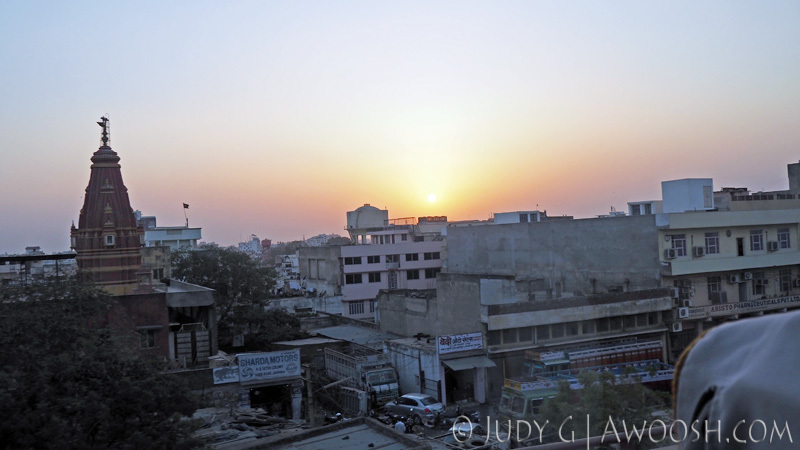 Delhi to Jaipur was a long haul, with hours of peering out the side windows of the bus, watching India whizz by. I kept my camera at the ready, hoping to capture some of the scenery. As I mentioned earlier in this thing, shooting out of the side window of a fast moving bus is not very satisfactory, but I did manage to get a few decent pix to try to illustrate the experience. 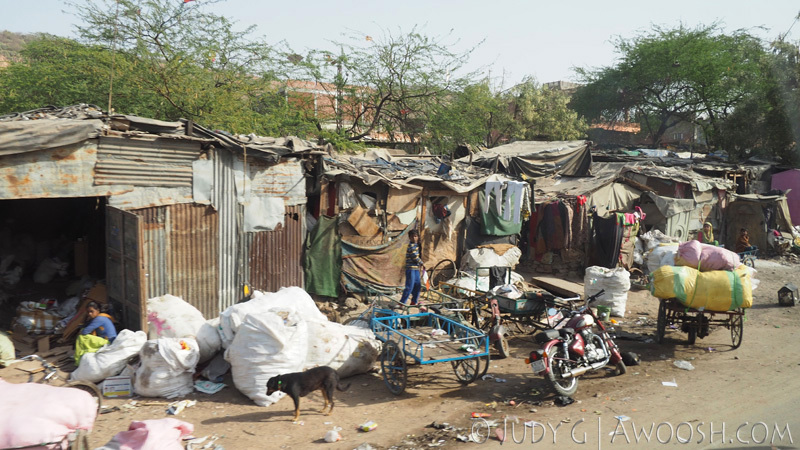 Just south of Delhi, really a suburb, is a new city – Gurgaon – layered over an ancient village. 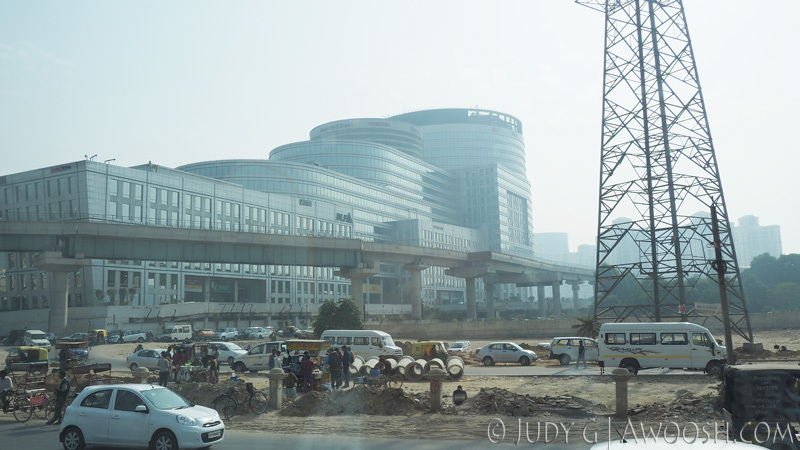 Gurgaon has now emerged as a super modern metropolis – a bastion of the emergent Indian middle class, and a major centre for technology business in northern India. Apparently call centres galore are located here. It is a pretty wild contrast between this uber modern city and the dusty countryside dotted with humble villages just beyond it. Big excitement when we saw our first camels. 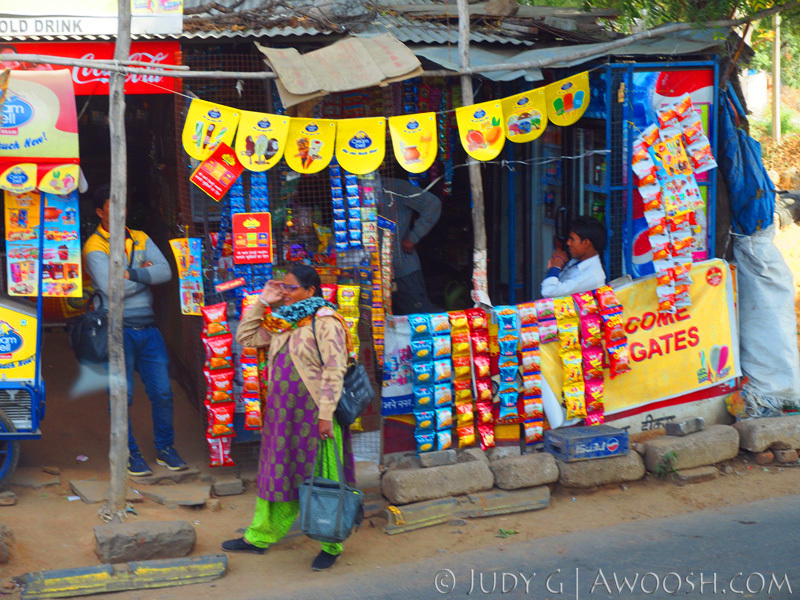 These colourful little stands are everywhere in India. Kind of like a corner store, selling snacks, drinks etc. There were scores of these furry little devils, in an encampment right next to the highway. The wheels on this bus aren’t going round and round. 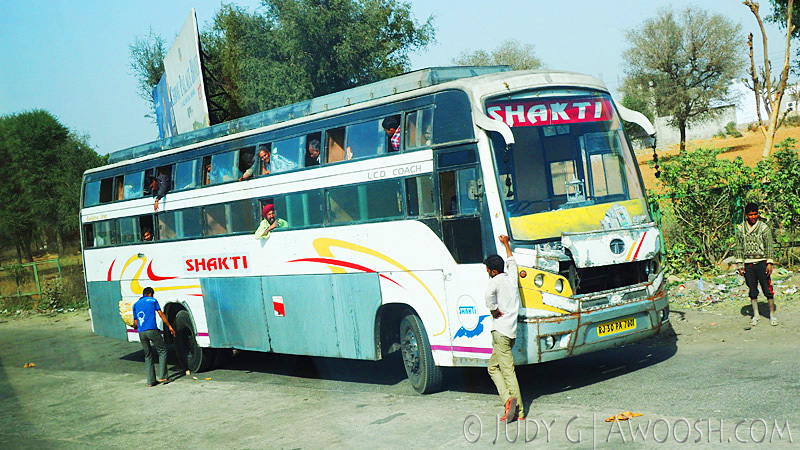 Broken down buses and trucks litter the sides of the highways in India. Check out the double decker layer on this one! 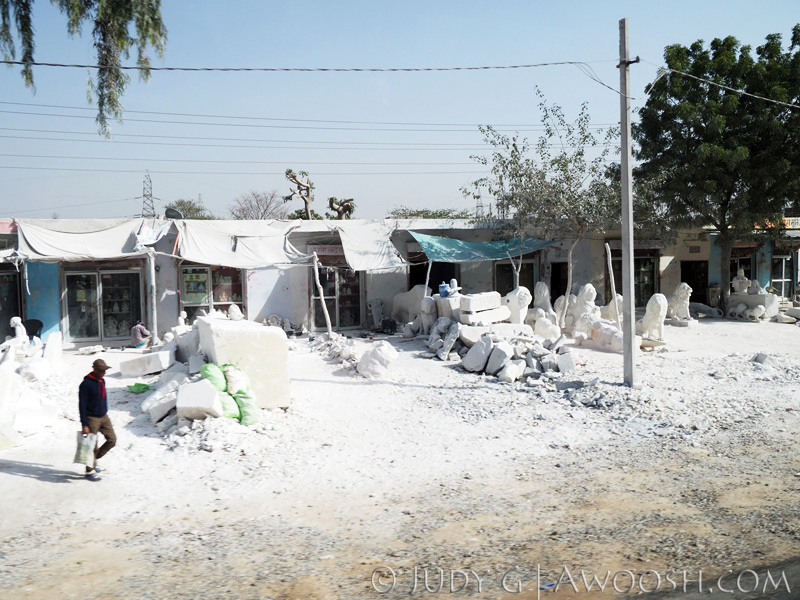 We saw quite a few of these marble carving yards between Delhi and Jaipur and between Jaipur and Agra. We also saw similar workshops for red sandstone carving. Statuary is big in the Hindu culture. Situation normal in the outskirts of the cities we visited. After the long day of travel, we were happy to hit the hotel, head to the gym, snork back a couple of excellent Indian beers, plus some wonderful dal and naan bread, and hit the hay. The next day was going to be another full one. 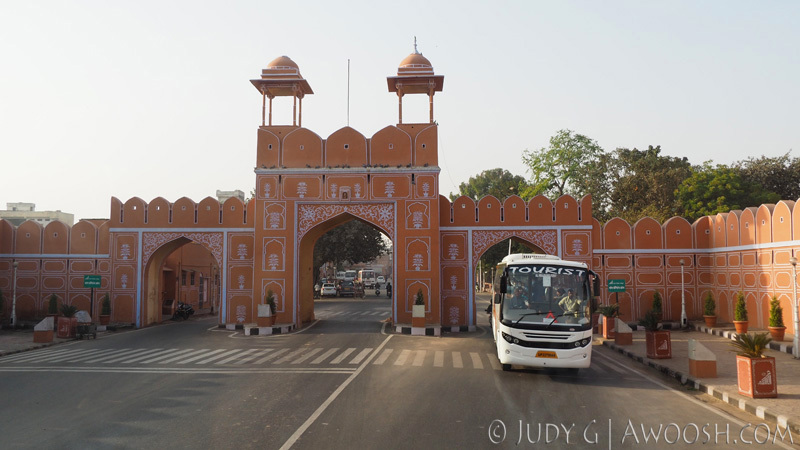 A tourist bus squeezes through one of the four main gates of the old city of Jaipur. 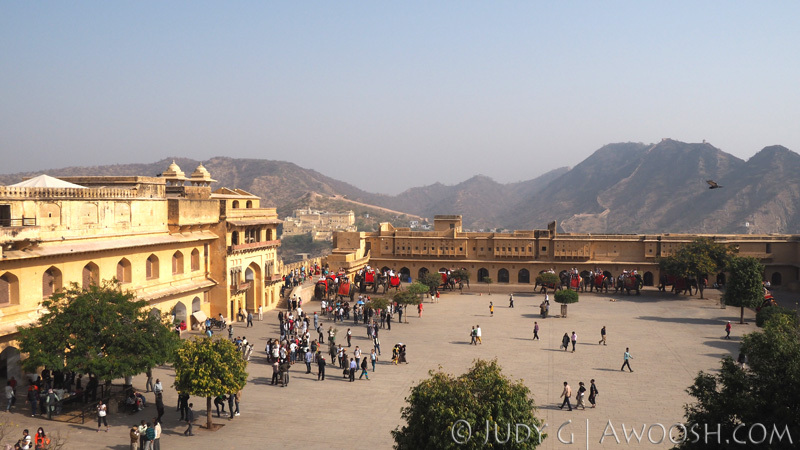 Back on the bus, for the twenty minute drive from downtown Jaipur to the Amer (also sometimes called Amber) Fort. 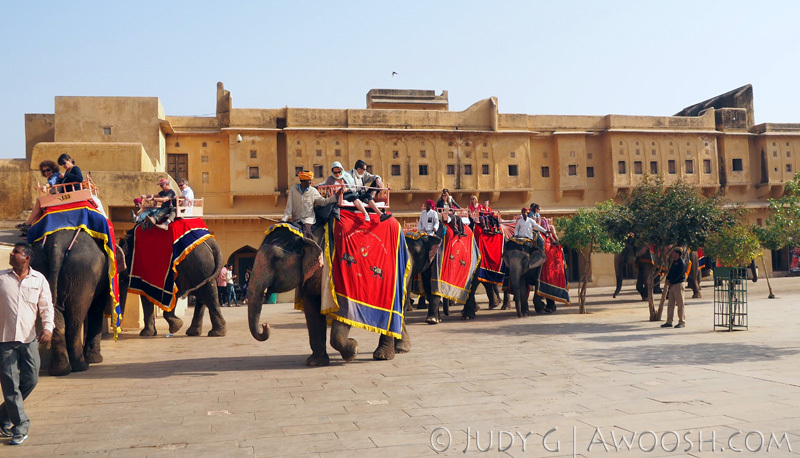 We were heading there fairly early in the morning, to line up to ride elephants up the steep hill to the palace on high. Some of us were dubious about the elephant thing – we were worried about the mistreatment of these animals. As it ends up, it appears that they have a pretty good life. They work from 9 until noon, and then are done schlepping tourists up the hill. 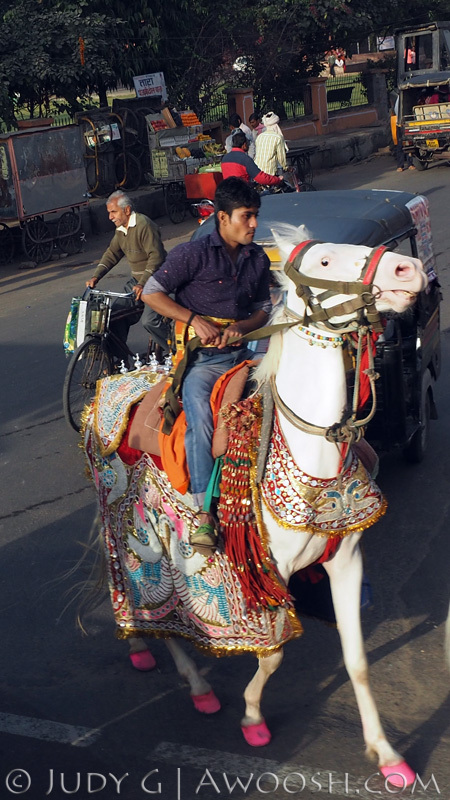 They may also be rented out for weddings, as it is a sign of prosperity for the groom to show up for the festivities riding a painted elephant. 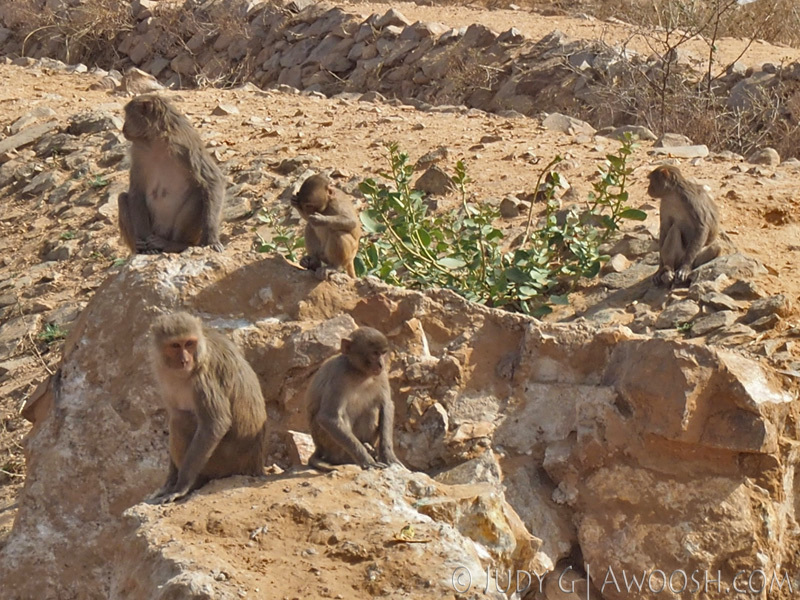 The animals look well fed and cared for, and I didn’t see any signs of brutality on the part of the drivers. Whoa Nelly! Check out the pink hooves! I believe this horse is decorated for a wedding. 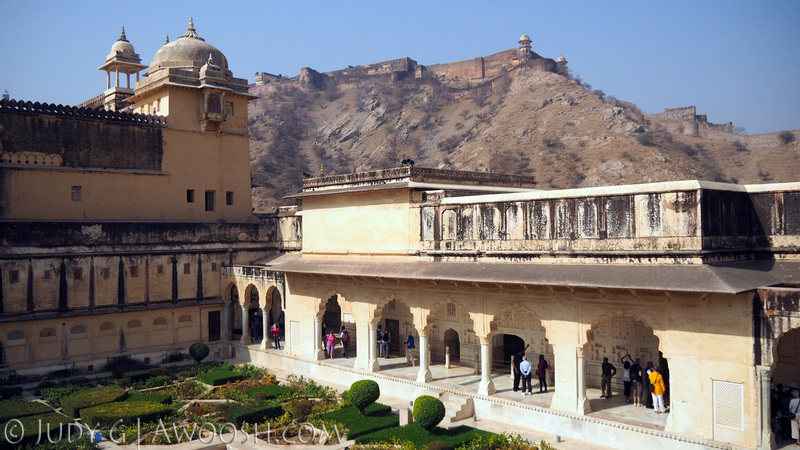 The Amer Fort is a huge, imposing structure, built strategically high on a hill. 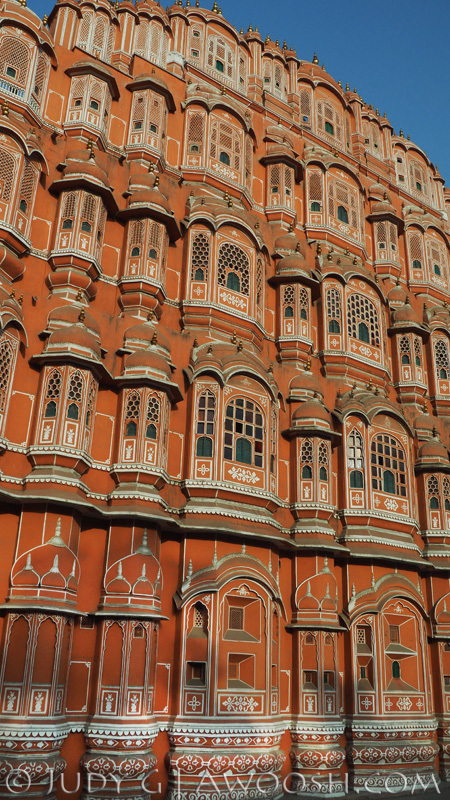 Construction began in 1592, and it is mostly made of sandstone. 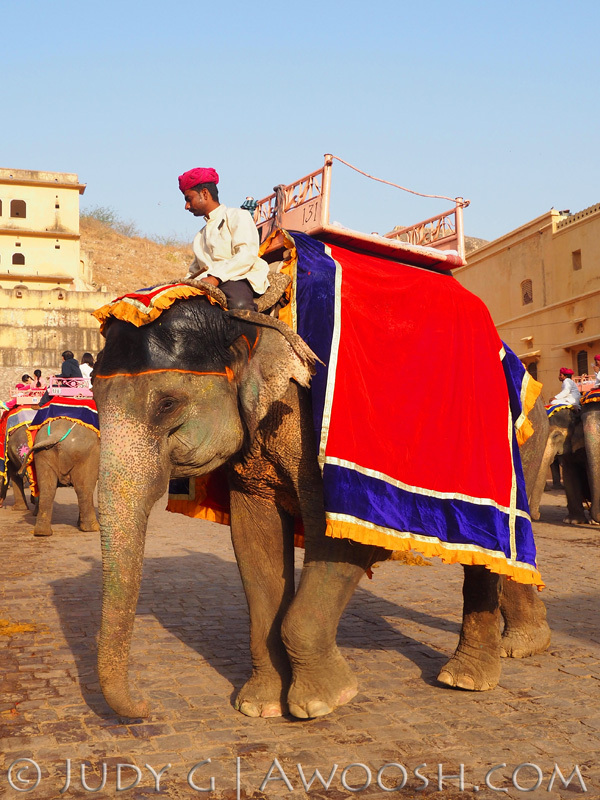 It is a super popular attraction for tourists – Indian and Western – as evidenced by the massive, serpentine queue of folks who lined up to cop an elephant ride up to the fort. 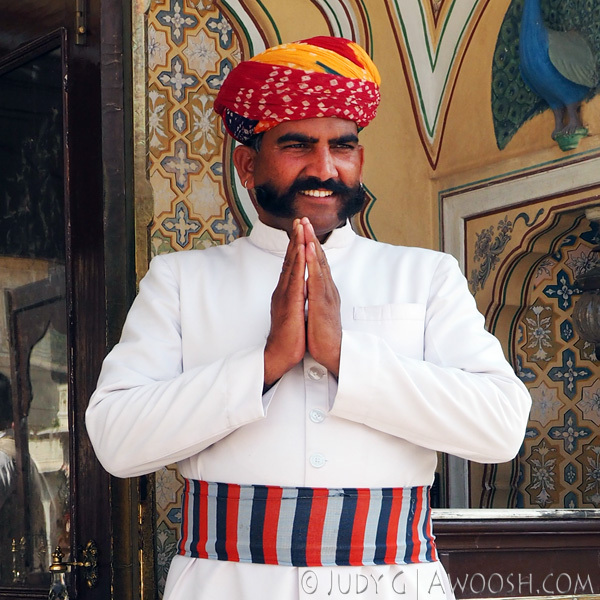 Jaipur itself is a major destination for Indian weddings, and we were there in the wedding season, so saw many highly decorated venues, grooms on painted elephants or decorated white horses, and parades of brides. 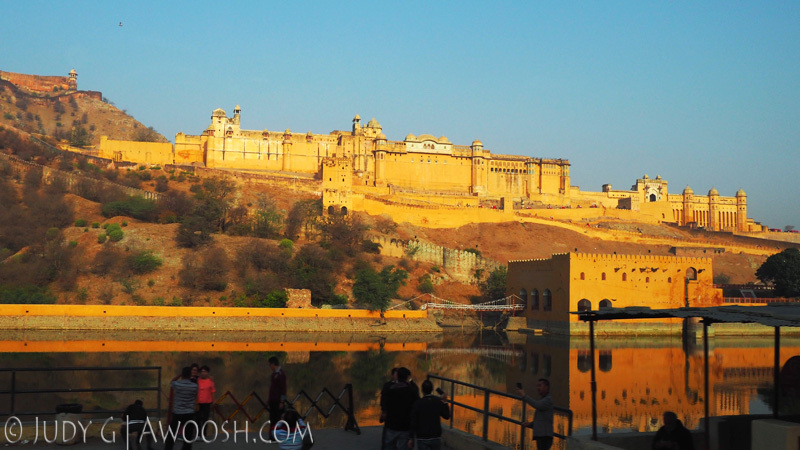 Amer Fort, with its lake in the foreground. 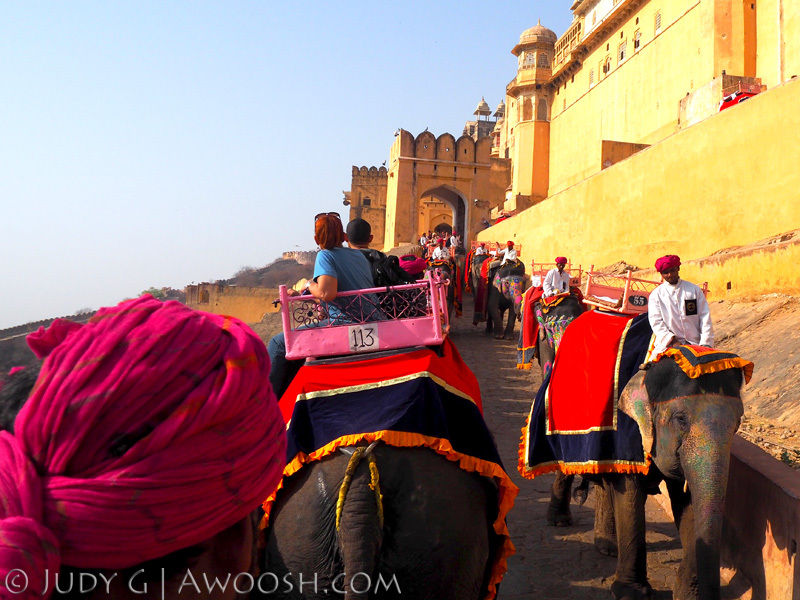 Traffic Jam at the Amer Fort. Elephants depositing their burdens into the grand square. View looking down to the grand square from the palace grounds. Looking up to the original Amer Palace, built even higher up in the hills. Formal palace gardens in the foreground. 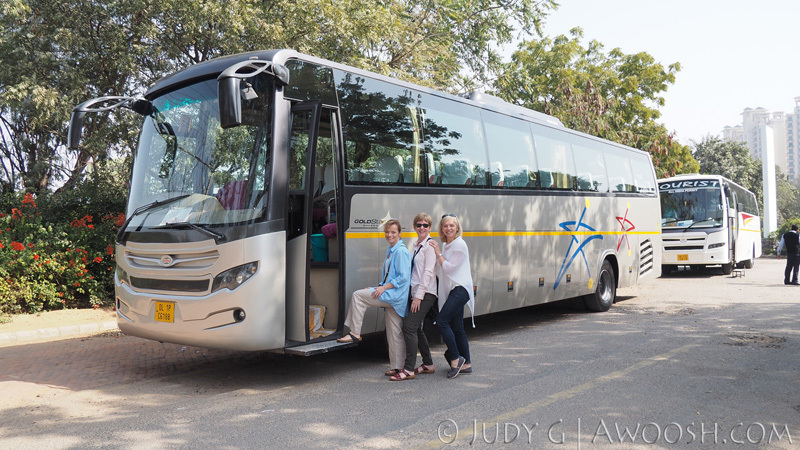 Once we had toured the large site, we were picked up on the other side for a wild jeep ride down some very steep and narrow streets, back to the bus parking area. It was the first of several occasions when I thought we might actually become statistical tourist fatalities in India. Driving back towards Jaipur, we stopped for a few minutes to view (from a distance) the beautiful Water Palace, surrounded by a manmade lake. 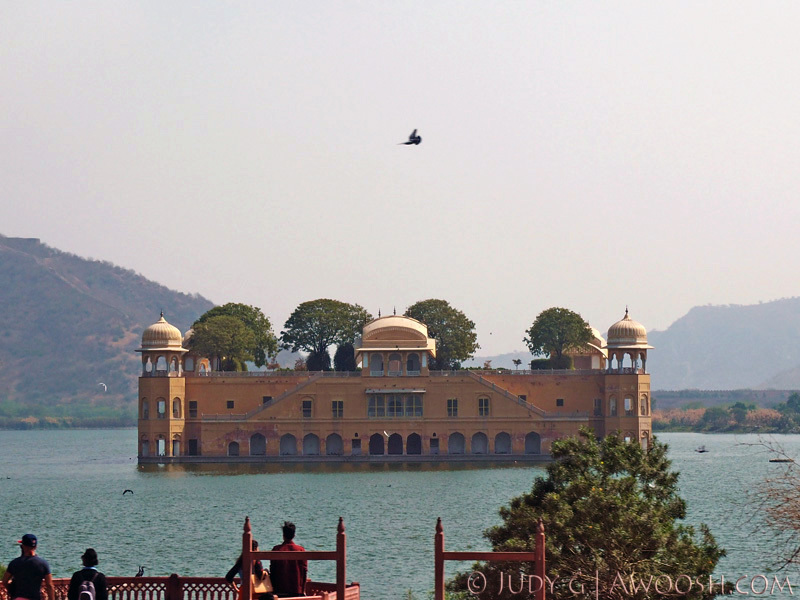 The lake was created in the late 1500’s, as a water reservoir for the area of Jaipur, which until then struggled with chronic water shortages. The palace is designed to allow the water level to rise and fall on and through its walls. 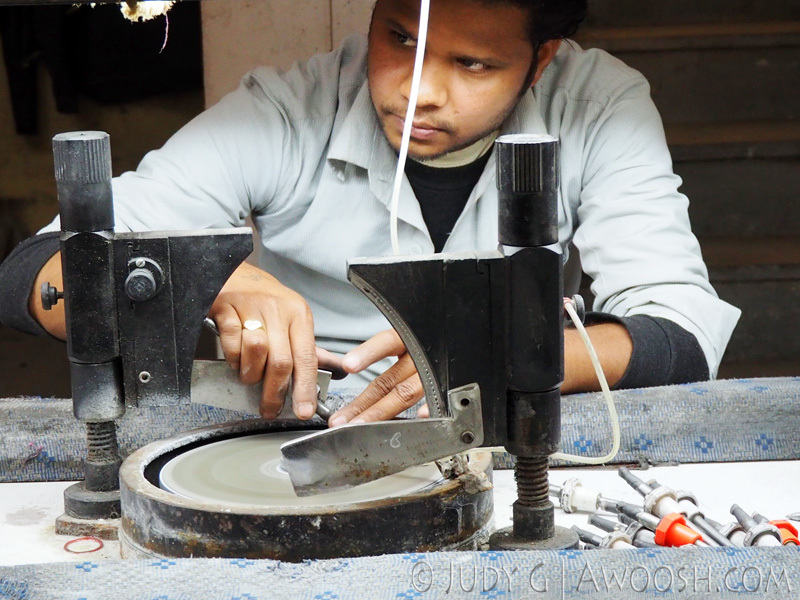 Our next stop was at a jewelry workshop and large showroom. 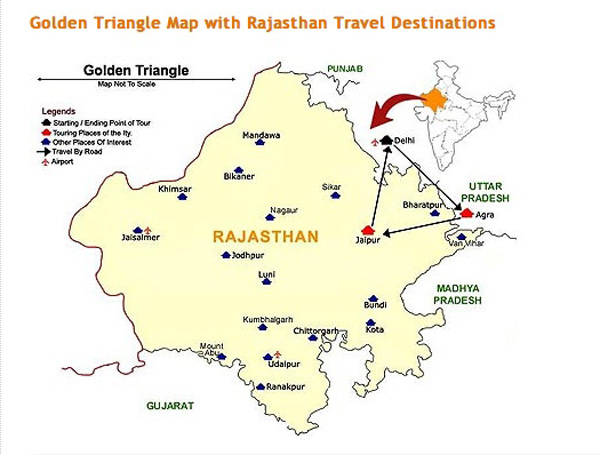 Jaipur is famous for is gemstones and jewelry making. Seeing a demonstration of gem cutting, which is done by highly skilled workers with very rudimentary tools (basically unchanged in centuries) was interesting. Avoiding the charming and persistent sales staff was hard work. 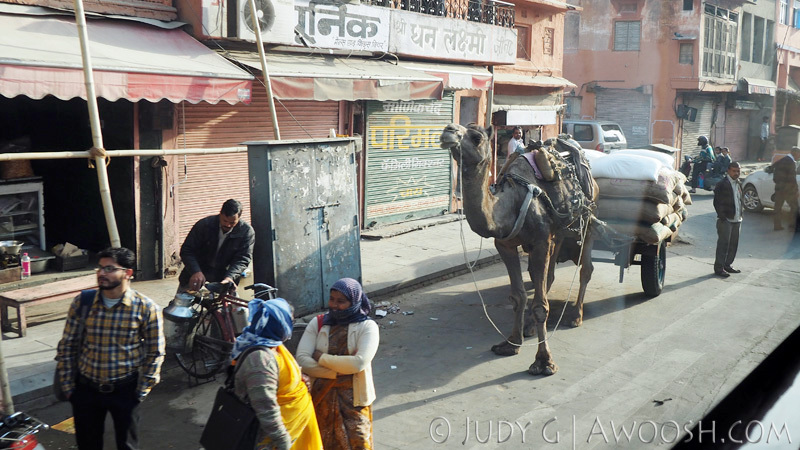 Typical side street in Jaipur. This was just outside the very posh jewelry emporium. 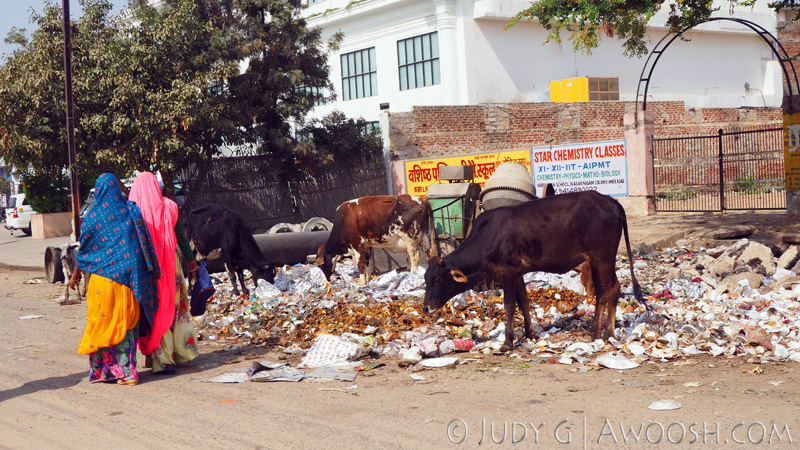 Seeing cows, dogs and monkeys feasting on garbage is a common sight in India. And this, dear reader, is where ‘the worlds colliding’ I alluded to in this chapter’s title happened. After being let loose from the brief formal tour, we were winding our way up one of the many stone stairwells – truly – this palace is like some sort of labyrinthine puzzle, with stairways and private viewing points out over the city, and a kazillion little rooms. I rounded a tight corner and literally ran into one of my daughter’s ex-boyfriends. I mean, seriously? Half way around the planet, in a country of over one billion people, in a city with a population of over three million (and with a huge number of tourists also visiting), in a massive palace of a place. Half a minute more, or less, and I never would have seen him. It kind of rocked my world for a day or two. Crazy! 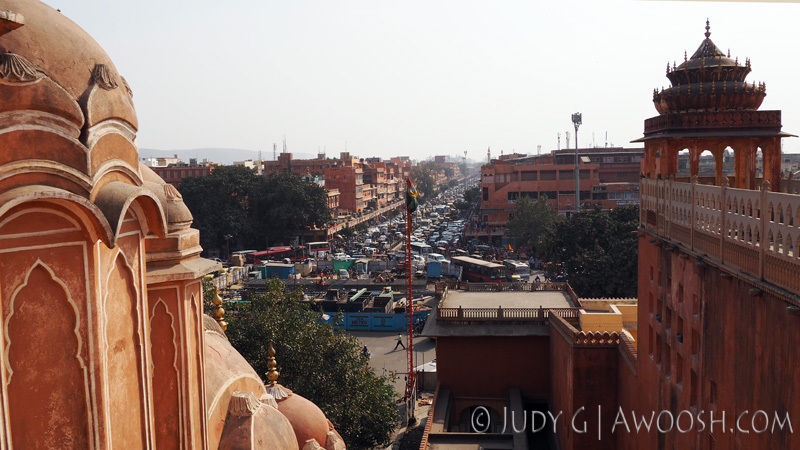 View from the Palace of the Winds down to the streets of Jaipur. Check out the traffic gridlock. Rickshaw tour of the old city. This is the second time in a day that I thought there was a good chance we would get smoked in a traffic accident. 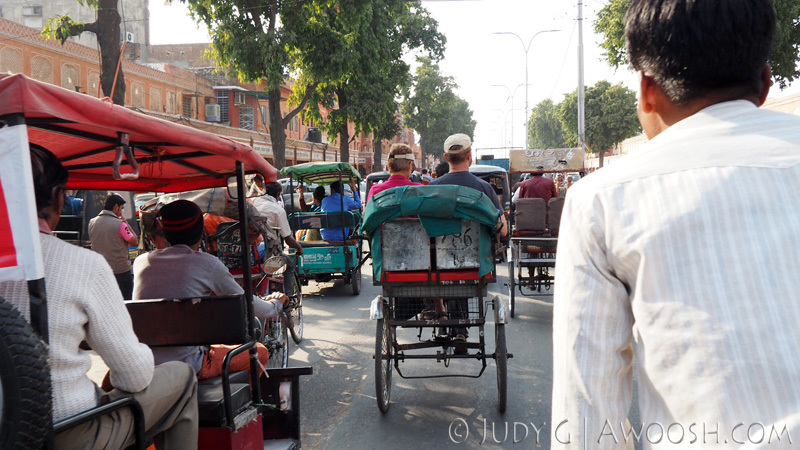 I’ve got to say that the rickshaw drivers are very energetic and artful and manage to negotiate the busy streets very cleverly. Our last stop for the day was at a Jaipur region textiles co-operative. 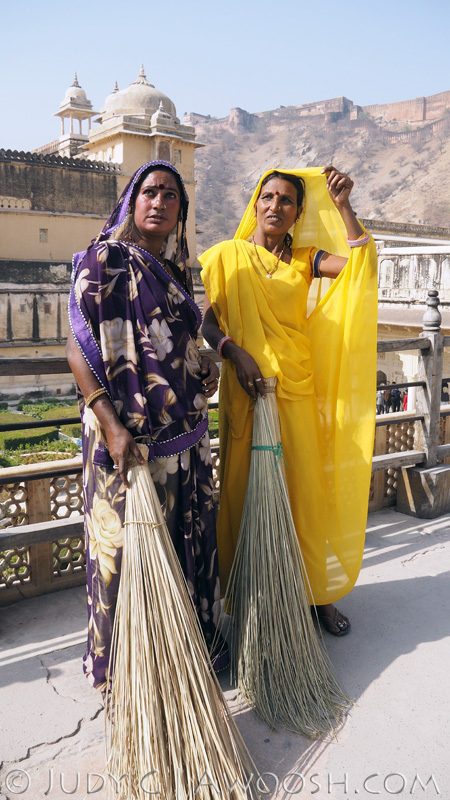 The government of India is working hard to keep the ancient arts alive, and this includes textiles. 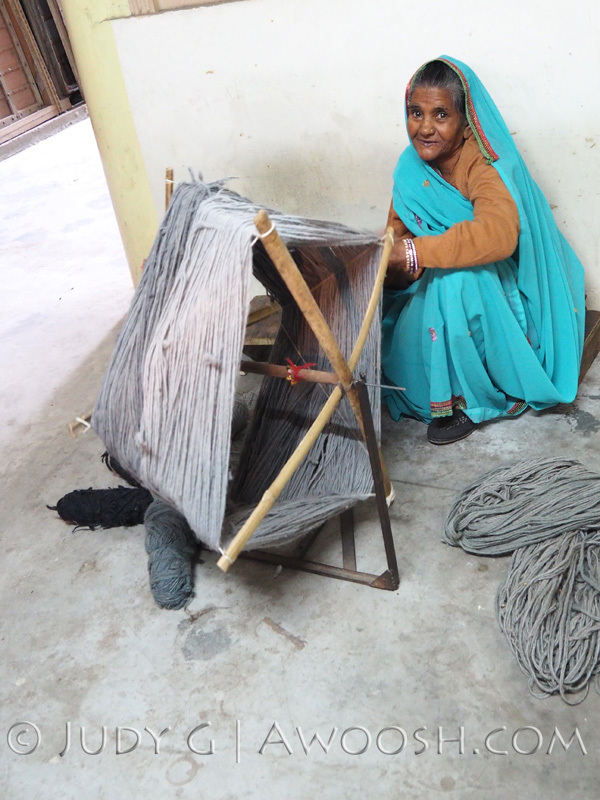 The hope is to keep the artisans in their villages, as overcrowding in Indian cities has become a huge social problem. Artisan co-operatives allow a main venue for regional arts to be demonstrated, and sold. We visited a similar market in Delhi, where we were shown some beautiful silk carpets loomed in Kashmir – in northern India. Tourists aren’t going to Kashmir these days, due to violent political turmoil, so without co-operatives in cities like Delhi to sell the carpets, it would be an even further hardship for the artisans of Kashmir. Carpet weaving demonstration. Each knot is hand tied. High quality Indian carpets have 400 knots per square inch. 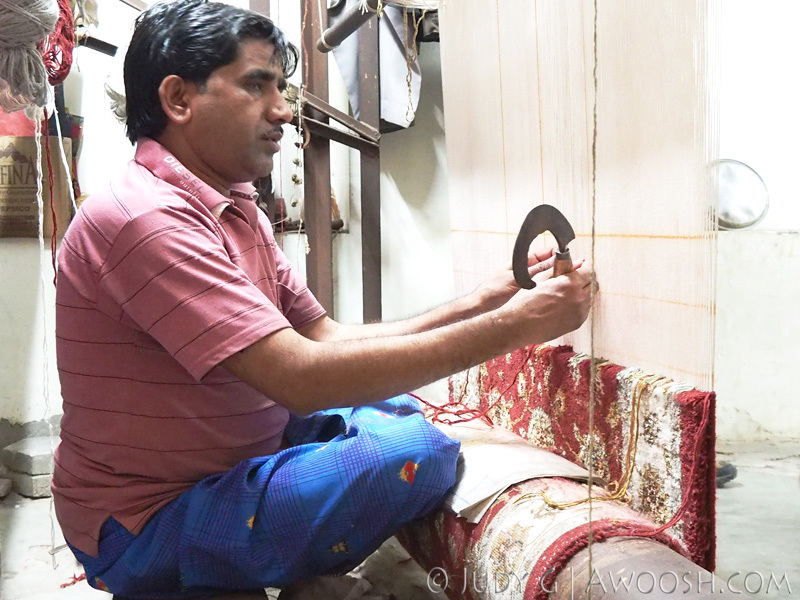 A carpet runner like these can take months to complete, and the labor is highly skilled. 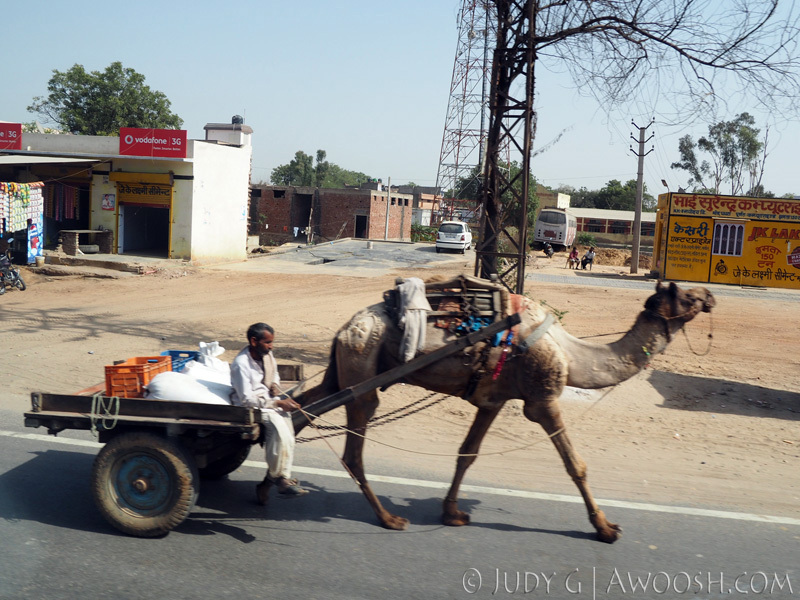 This entry was posted in Photography, Travel, Trip Reports and tagged Amer Fort, Bicycle Rickshaw, Golden Triangle, India, Jaipur, Rajasthan, Water Palace. Bookmark the permalink.